I’m partied out … time to rest. 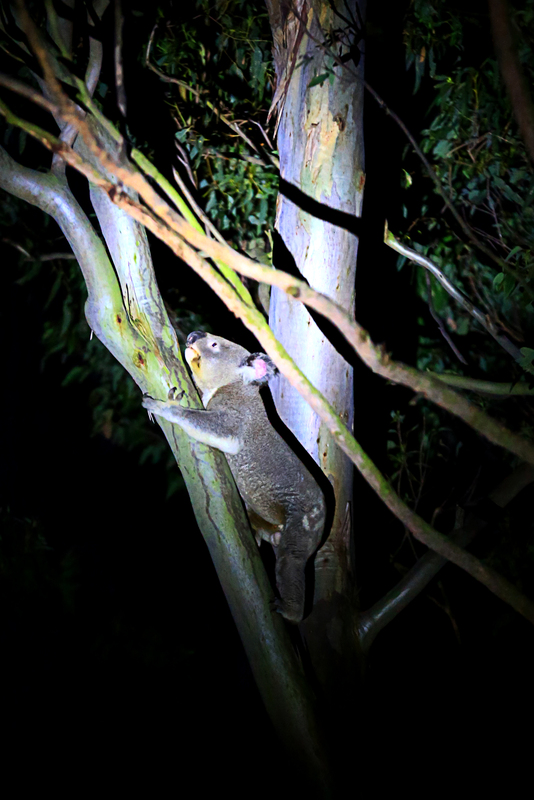 September to March is Koala mating season and Photographer, Alan Moore, reports that on Tuesday night there seemed to be a late night party in the trees behind his house. Alan identified the sounds of three different Koalas … typically lots grunting, hissing and squealing/screaming. Photographing Koalas high in the trees is difficult at the best of times. At 11:30pm it is a bit of an art. 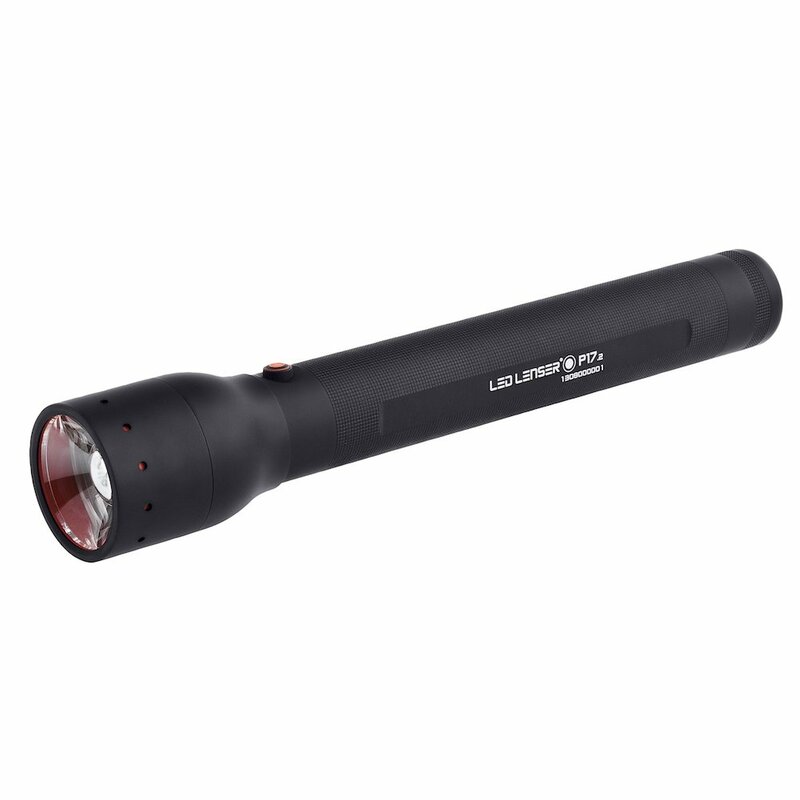 Alan uses an LED LENSER P17 torch that can be focused into a power spot light beam. The bright white LED light is ideal for photography even for back-lighting in daytime. 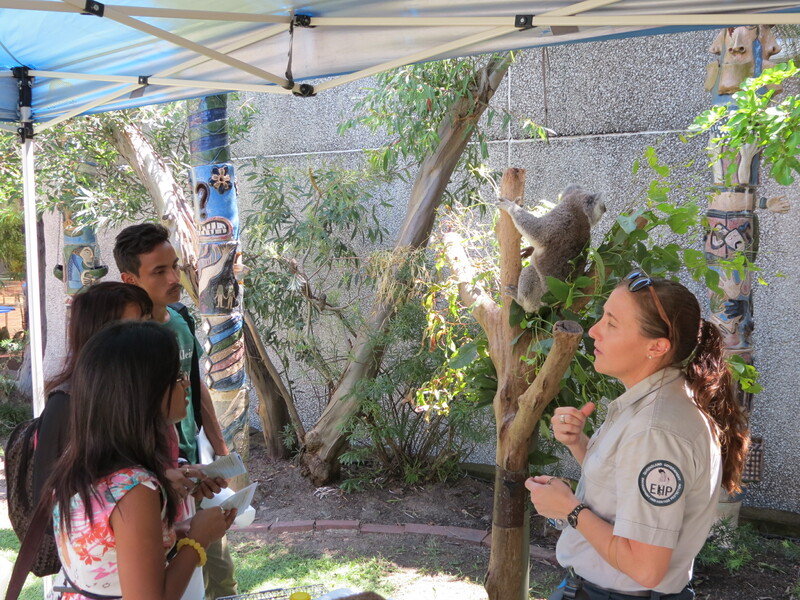 International students are an important group of potential volunteers for bush restoration work so Kristen and Elsa the Koala joined us at the QIBT (Queensland Institute of Business Technology) OWeek Market. Elsa, who normally lives at the Daisy Hill Koala Centre, was a real hit with students from as far away as Japan, China and Sri Lanka. Kristan also amazed students with the body of a three day old joey Koala. Just 30mm long the joey would have made an extraordinary journey to its mother pouch after birth. Unfortunately the mother was hit by a car shortly after and the joey was found in the mother’s pouch. In south-east Queensland we are lucky to still have some significant Koala habitat with protected areas like Daisy Hill Koala Centre however development pressure is impacting. 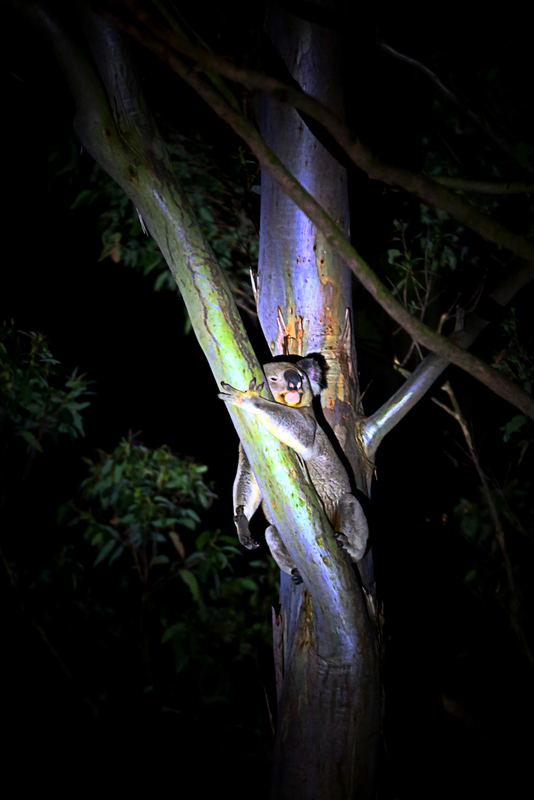 In Mt Gravatt Conservation Reserve and surrounding urban areas we are seeing a return of Koalas that, as recently as 1927, were hunted for their pelts. Nature is giving us a second chance with Koalas so students engaged in restoration of Mt Gravatt Conservation Reserve will be making a valuable contribution to a unique Koala habitat just fifteen minutes from Brisbane CBD and right beside their university campus. 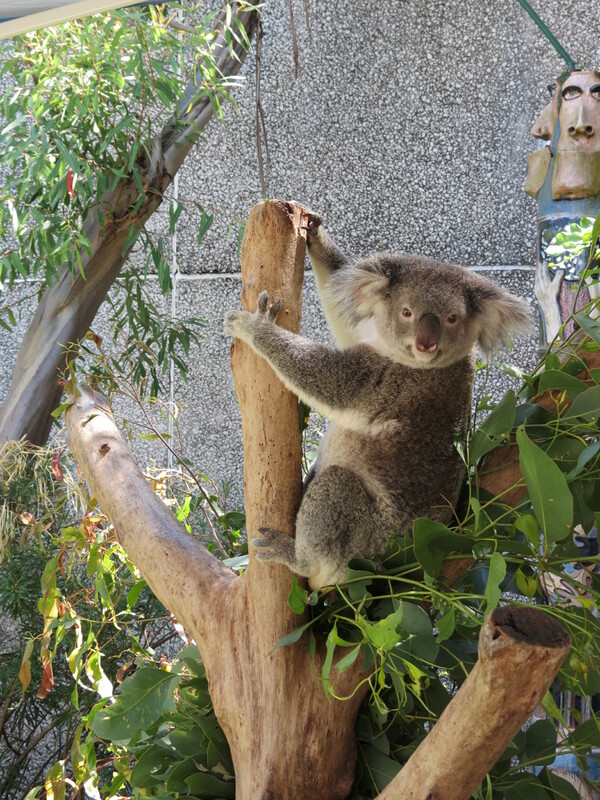 Students are also invited to visit Daisy Hill Koala Centre – free entry. Daisy Hill Koala Centre – Sunday 30 March. 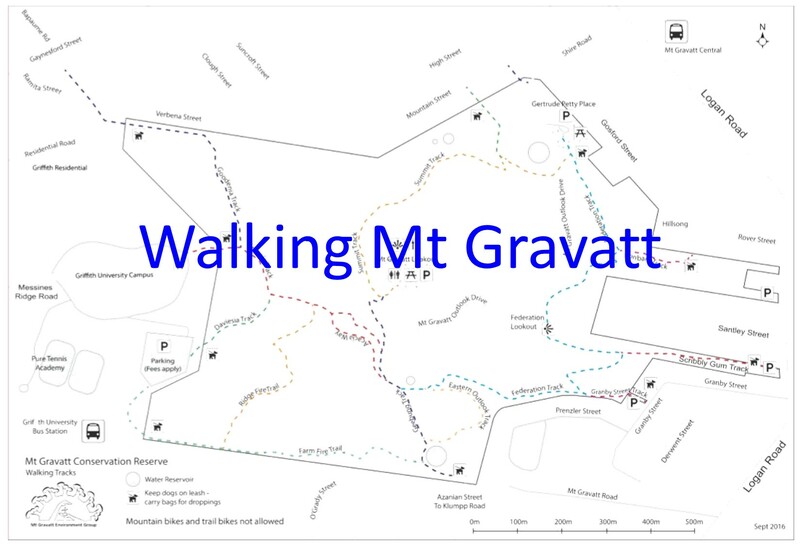 Dogs off-leash are one of the three key threats to Mt Gravatt Conservation Reserve. Take the opportunity to learn about making your dog wildlife friendly. Last month I joined Wildlife Ambulance officers, Garrett Smits and Vicki Pender, to return Coppa the Lucky Koala back to bushland adjoining Bulimba Creek at Mansfield. 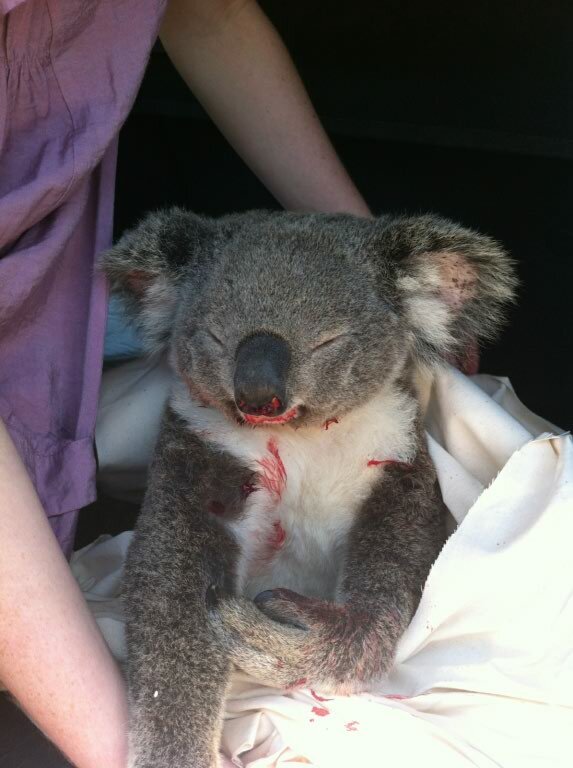 This is the third time Coppa has been taken to the Moggill Koala Hospital after being hit by a car on Creek Road. Injured Koalas taken to the Moggill Koala Hospital are all given a name and micro-chipped before being released to bushland as close as possible to where they are found. Coppa is a 5.5 year old male in good health … and very lucky. 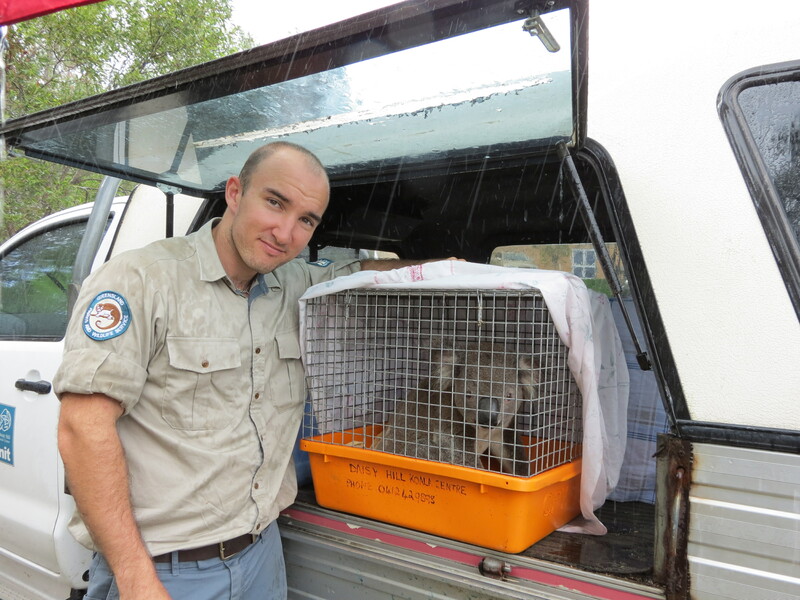 Vicki and Garrett are obviously proud of their Wildlife Ambulance work and particularly fond of this lucky Koala they have now rescued three times. It was a pleasure to see a Koala return from hospital back to the wild. Koalas are breeding successful again in Mt Gravatt Conservation Reserve and bushland along Bulimba Creek. However, city drivers are not used to having to slow down for a Koala crossing the road. Breeding season from September to March is the time when Koalas are most likely to be crossing roads. Coppa was hit in the same area each time … just within the 70km zone as you come down the hill from Carindale towards the Bunnings corner. 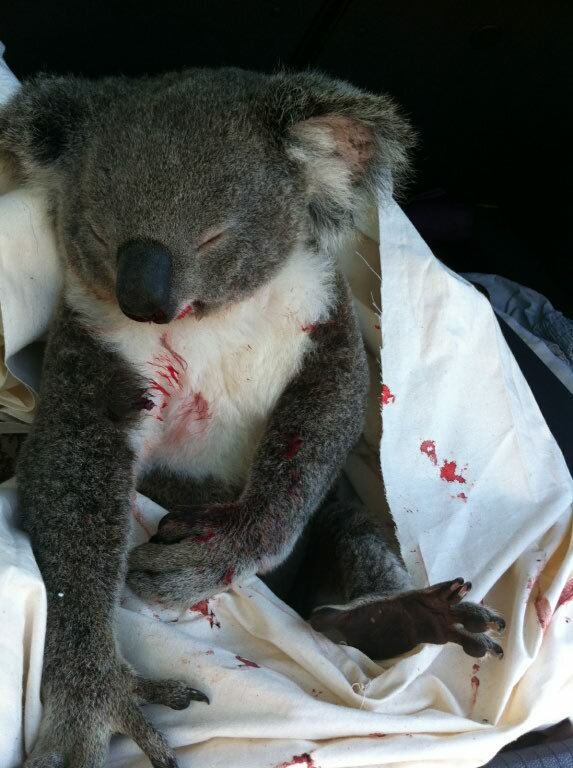 Please be careful and report injured Koalas to 1300 WILDLIFE. This week we were honoured with a visit to Fox Gully Bushcare by Kristen Collie, Ranger at Daisy Hill Koala Centre. Mt Gravatt Environment Group is now sharing data on Koala sightings with the Koala Centre with intitial data suggesting that our furry friends a quite active in surrounding streets. One fact that really stands out is the number of Koalas injured by dog attacks in backyards or hit by cars on the roads. The Koala Centre, which comes under the new Department of Environment and Heritage Protection, operates the Koala Ambulance during business hours. Rangers take injured and dead Koalas to the Moggill Koala Hospital and record details locations. Brisbane City Council also operates a 24 Hour Animal Ambulance – call 07 3403 8888 for any sick or injured wildlife – even Blue Tongue Lizards. Kristen was also impress by our community’s commitment to habitat restoration and restoring wildlife corridors. We visited Zone 13 where our Tuesday Bushcare group have removed a huge area of Fishbone/Sword Fern Nephrolepis cordifolia. We then moved onto inspect the restoration where the wildlife corridor cuts through private properties to Klumpp Road. 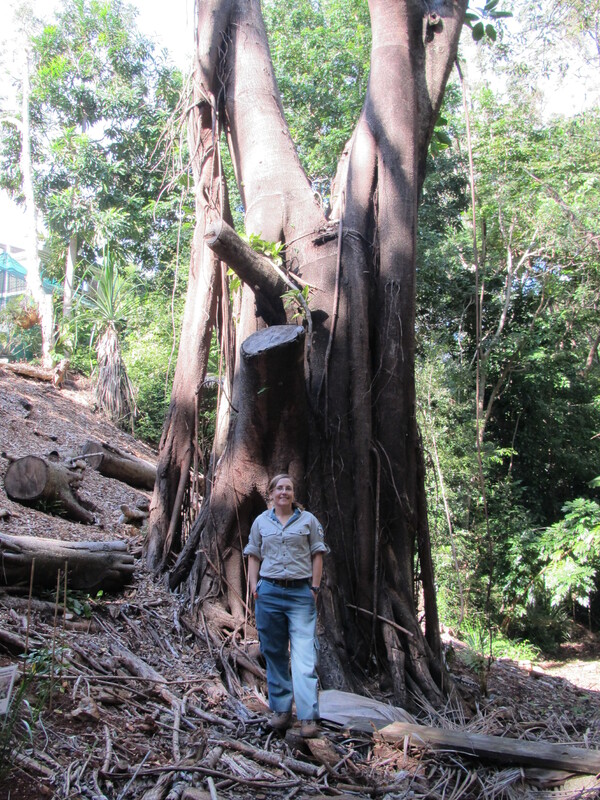 Standing beside the stump of the huge Indian Rubber Tree and seeing water trickling down the gully from the restored spring, really demonstrated the community commitment to our wildlife. Our 2012 Community Gully Day is planned for Sunday August 5th and will concentrate on replanting the area cleaned up in 2011.